Holiday travel season is underway, and, though it comes with the promise of turkey hangovers and time spent with loved ones, it also means having to endure high gas prices, inclement weather, traffic and crowded airports. GateGuru is releasing a new version of its iPhone app today with a revamped interface and several new features aimed at taking some of the anxiety out of security lines and getting to and from the airport. Deemed the “Yelp for airports,” GateGuru launched in 2009 to take some of the stress out of the airport experience by giving travelers mobile access to food, shopping and service options on the go. While TripAdvisor can be great for planning and Expedia and Kayak work well for booking, GateGuru is on a mission to be the go-to resource for the day-of-travel experience. GateGuru gives users mobile access to things like airport amenities — which are sortable by food type, shops and services — real-time ratings and reviews, and the ability to locate the nearest gift shops and ATMs. The Android and iPhone apps also allow you to keep tabs on restaurants you’ve visited in the past, earn points for checking in at various locations, manage itineraries and access crowdsourced security wait times. To date, the app’s community of nearly 1 million users have generated nearly 30K reviews of airport amenities. GateGuru has been quiet over the last year, but today’s release sees the app getting a whole new user experience that focuses on automatically pairing amenities and security wait times through the app’s “Journey Card.” In other words, until now, users had to go look up security wait times and amenities by airport and terminal, but travelers no longer have to go through this process manually, as that information is now automatically linked to their flight and itinerary. It also allows users to pull amenities outside of their terminal in the event of a long wait or layover, enabling them to view the best the airport has to offer — not just what’s in the immediate vicinity. 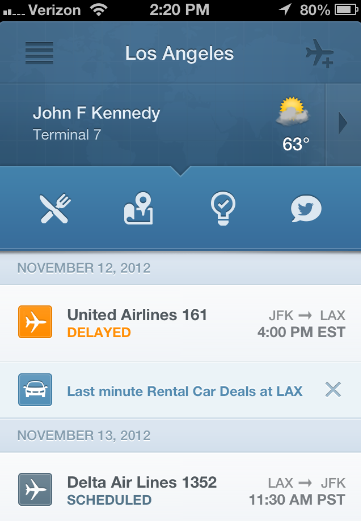 Once users email their itineraries to GateGuru or add their flight directly in the app, it pulls relevant information for the traveler, including delays, weather conditions, security wait times, flight status (with the option to enable push notifications for gate changes and delays), amenities and maps. The redesign really focuses on beefing up the app’s personalization features and gives it the feel of a travel assistant rather than a simple mobile airport restaurant review tool. Beyond auto email itinerary pairing and a more personalized user experience, the other key to the new app is the addition of rental car deals. Through an exclusive agreement with Avis-Budget, GateGuru now offers last-minute rental car deals at 5 to 40 percent off their normal rates. 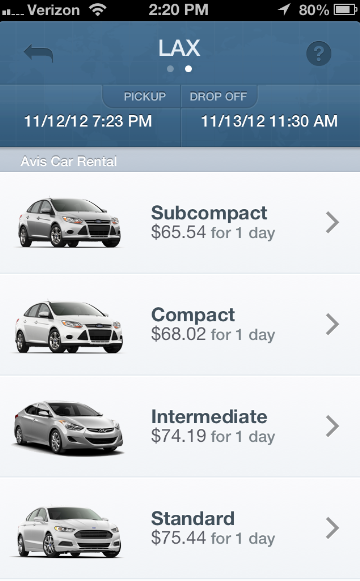 The team describes this as the equivalent of HotelTonight for airport car rental. Nothing can remove all of the pain and anxiety of holiday travel, but this is, at least, a step in the right direction. Another thing that would help alleviate the pain of airport-based travel? Being able to show up to Thanksgiving dinner in a cool car. So, to take it one step towards a stylish exit, it would be great to see GateGuru add Silvercar integration — once the service has actually launched, of course.